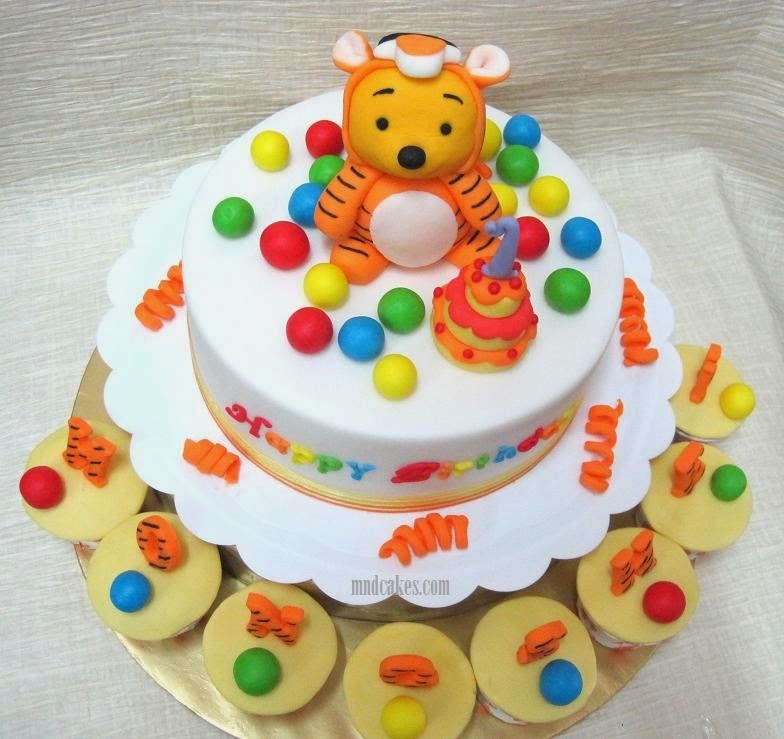 Mom And Daughter Cakes: Winnie The Pooh And Tigger Fondant Birthday Cakes - Happy 2012! 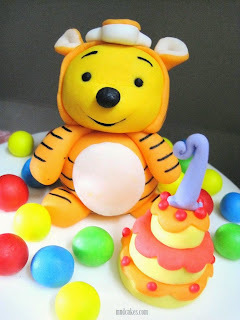 Winnie The Pooh And Tigger Fondant Birthday Cakes - Happy 2012! It's a brand new 2012! We would like take this opportunity to thank our clients and subscribers for their suppport. For our readers who drop by on and off or incidentally, we would like to thank you for taking your time to read what we wrote and wish you a happy new year too! 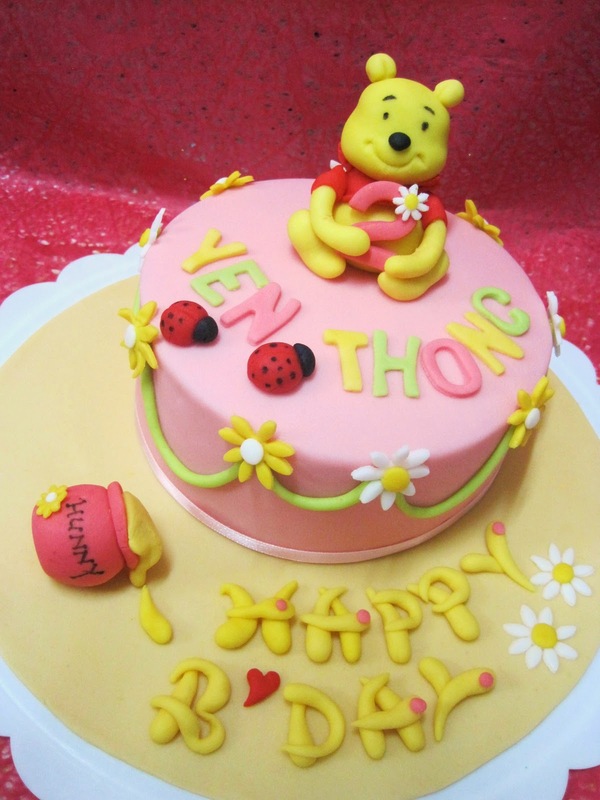 In 2011, we had received more cake orders and gone through much challenge in cake design and also customer requests. The more people we met the more questions arise. Sugarpaste or fondant cake had become more popular and common though many more people haven't come across it. We don't mind to explain and tell you more about fondant cake from time to time. Hopefully more people get to know about fondant cake and its pricing. Fondant cake is very different from fresh cream cake which is so common here and sold at most of the bakeries locally. It is made of a kind of hardened white icing which is colourable (with edible colours of course) and sculptable into different shapes and designs. 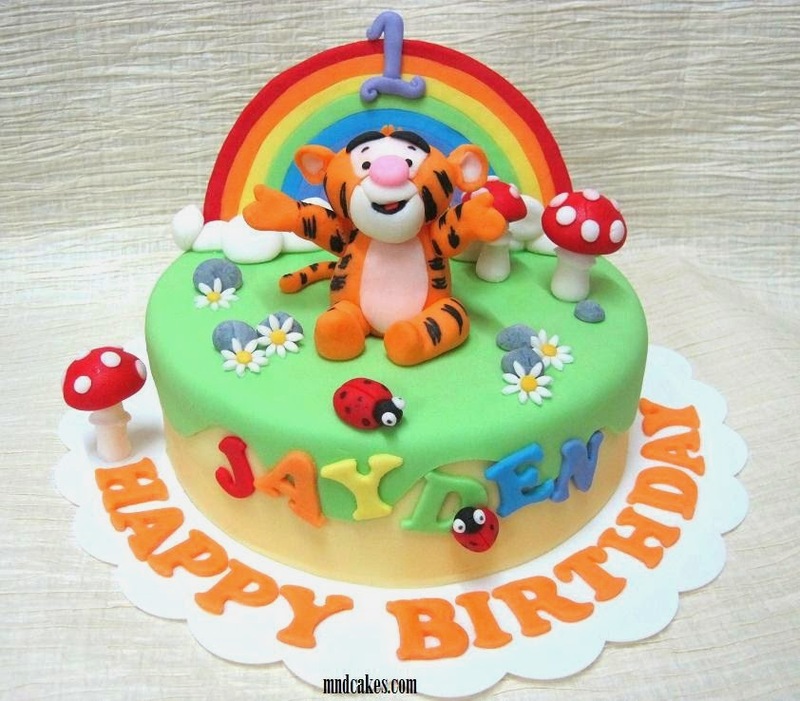 Like a play dough, we need to knead, roll, cut, press, mould (if there is a mould) and sculpt (free hand) the sugar dough to realize a desired design. The amout of time we spend varies from few hours to few days, not to mention the effort behind and well......nights of sleep sacrificed (aging faster, ha!). Fondant cake is a form of arts that need a skillful hand and mind to perform and we have to do it slowly and carefully to produce a precious cake piece. How do you judge a design? There is no exact guideline. According to competition rules, no matter what design is executed, it has to be finished neatly and precisely. For instance, a Tigger must look like a Tigger and Pooh look like Pooh *grin* and the cake must not look messy. Every cake designer has his own style. You can check out his/her portfolio for his/her style of design. Some designers prefer simplicity whilst others prefer more complicated design. Some are figurine experts whereas there are designers who are specialized in flower making, cake painting or piping with royal icing etc. There are many options available. So, a good survey would help to decide a designer who could fulfill your need. Wish everyone dropping by a very happy, healthy and fruitful 2012! These cakes are so cute! !